This beach ranks #6 of the "Best beaches in Lhaviyani atoll"
Komandoo Island Resort & Spa is a great 4 star "adult only" property with rooms' fares starting from US$320 per night. 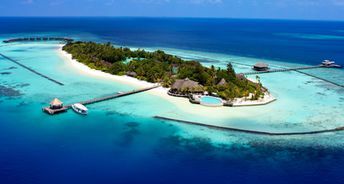 It is also known as Komandoo Maldive Island Resort. Fly to Maldives international airport (MLE). Next fly to Komandhoo island in 40 minutes by the seaplane (the return fare is US370). The best time for a holiday on the beaches of Komandoo island is a dry cool season in the winter half of the year.